Birthmarks, café au lait spots—although usually harmless (over 10% of the population has one or two), the presence of more than 5 of them in a child can conceal a hereditary disease, neurofibromatosis type 1 (NF1). This is one of the most common genetic diseases (affecting 1 in 3,000 individuals). Until now, the molecular mechanisms associated with altered skin pigmentation were poorly understood, particularly since few appropriate models have been developed in the laboratory. Inserm researchers at I-Stem (Institute for Stem Cell Therapy and Exploration of Monogenic diseases) have developed a model reproducing in vitro the hyperpigmentation associated with type 1 neurofibromatosis from embryonic stem cells carrying the mutation responsible for this disease. By establishing a protocol for differentiating these cells into melanocytes (the cells in the skin that can produce the melanin that gives it colour), the researchers were able to find the cause of generalised hyperpigmentation and formation of “café au lait” spots. The loss of neurofibromin expression in these NF1 melanocytes leads to a cascade of dysregulation. First, dysregulation of the AMPc and ERK signalling pathways, followed by dysregulation of the transcription factor MITF, and ultimately, increased expression of the enzymes involved in melanin production. To correct this, the researchers used pharmacological inhibitors specific for these different signalling pathways, and were able to restore the cells to normal pigmentation levels. This hyperpigmentation defect could be corrected by single small molecules (such as kojic acid, which is already contained in skin creams or lotions for lightening the skin), demonstrating the potential of pluripotent stem cells as a model for the study of pigmentation disorders. The researchers now plan to identify and characterise the molecular mechanisms associated with other pigmentation-related conditions to find new therapeutic strategies, which are currently based on the use of mouse models, in which the melanocytes do not have the same location as in humans. 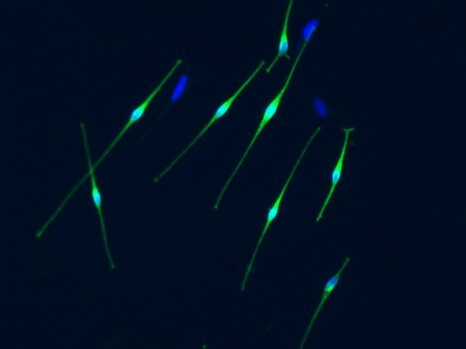 These stem cells represent an unlimited source of cells that can theoretically differentiate into all the types of cells in the body, thus making it possible to demonstrate pathological phenotypes.